Filling the upmarket bar niche of the re-branded Crown Perth, The Merrywell takes to task with a New York style bar serving well-executed pub food with enough meat and deep fried dishes to leave not many wanting. Filled with warm and orange glows in different sections of the pub/restaurant, splashings of retro-style fittings and wallpaper, and an audibly played mix of music from yesteryear (try the 80s) through to modern, The Merrywell is suited to casual meals through to group catch-ups despite being labelled as serving "dude food". Here you will find each of couples and groups having casual meals through to good folk having drinks at the bar. The Merrywell has a separate lunch and dinner menu, though it's more a full menu provided at dinner that has had more of the casual lunch dishes taken out and placed into the shorter lunch menu (though there's an even shorter bar menu). 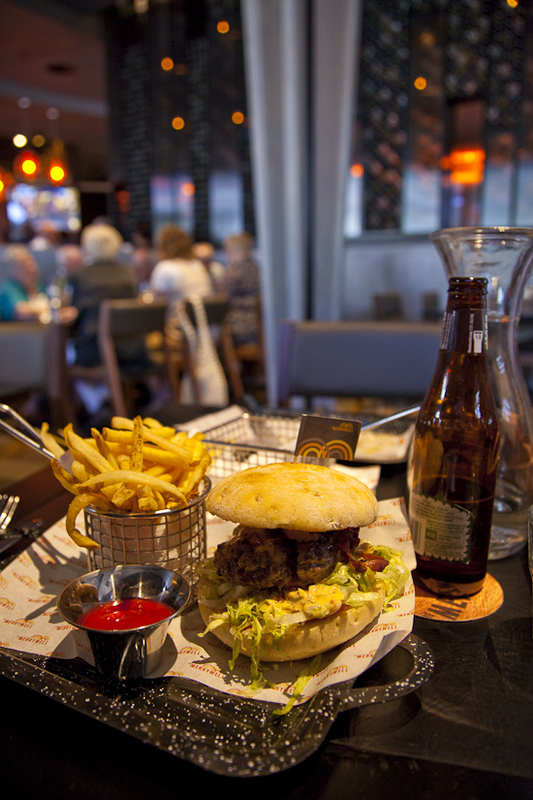 The lunch menu is centred around burgers and sandwiches with some share plates, sides and salad, whilst the dinner menu has all of those meals but expands into a greater selection including pub grub and main course selections (such as ribs, chicken and steak). Of course, being in essence a bar, there is a drinks/bar menu that includes local and imported beers, ciders, a bar selection of wines, cocktails and seasonal jugs (like cocktail mixes served in jugs). The overall selection isn't as expansive as a wine bar or some fine dining restaurants, but the varied selection is good for a pub and sure to satisfy most. The Merrywell Angus Burger is described on the menu as containing aged cheddar, bacon, secret sauce, caramelised onions, LTO, pickle, fries. The core of the Angus Burger, the patty, was a thick (though not wide enough to cover the full size of the bun) chunk of Angus mince. True to the menu's statement "all burgers served pink and juicy" the patty was very pink inside, quite rare looking and a tiny bit chewy in texture. The burger in a white bun was then served with the other fillings - well cooked but not crispy bacon, caramelised onions, lettuce, tomato, American style pickle and sauce through the lettuce that seemed like a cocktail type of sauce - no mayonnaise in sight. Each of the flavours from these was distinct in the burger and combined into a well flavoured pub style burger. The burger was served with a mini frying basket of salted crisp french fries and tomato ketchup. The serving size of the fries was a little deceptive considering there was a napkin loosely stuffed at the base of the basket but nonetheless the small serving of fries is probably all you need if you have entrees or sides. Overall, the chunky Angus beef burger with its sweet, savoury and sour flavours from the sauces, pickles and bacon made a nice gourmet burger served with those crispy thin fries. My only concern was that (probably being quite new) the Angus burger arrived significantly after the rest of the meal came and was consumed, and after we asked the wait staff. 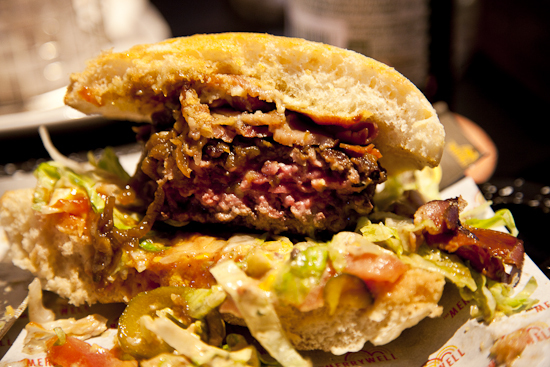 The slightly sloppy nature of the burger and its placement on the plate may also have been a result of it being rushed. The D&G BLT is described on the menu as containing porchetta, pork belly, pancetta, SSU egg, rocket, tomato, bacon aioli, bacon bread, crisp onion rings. With three types of pork in this BLT (yes, three! ), I think this "BLT" is a little misleading - in a good way. A crusty and crunchy bacon bread (a little like ciabatta bread) was first buttered then layered with the three cuts of pork, from a bacon style (I think) pancetta through to a (presumably) roasted pork style pork belly. Each layer was quite thin such that the "B" didn't dominate the other ingredients in the "BLT" but still provided a good meat base worthy of a BLT with a twist. Between the grilling and the toasted (with a little bit of charcoalon the edges) bread, the BLT had a light and nice smokey flavour. The BLT was then filled with a runny fried egg, rocket, tomato and spread with bacon aioli (see below in the chips section) and topped with four crispy and light batter coated onion rings. 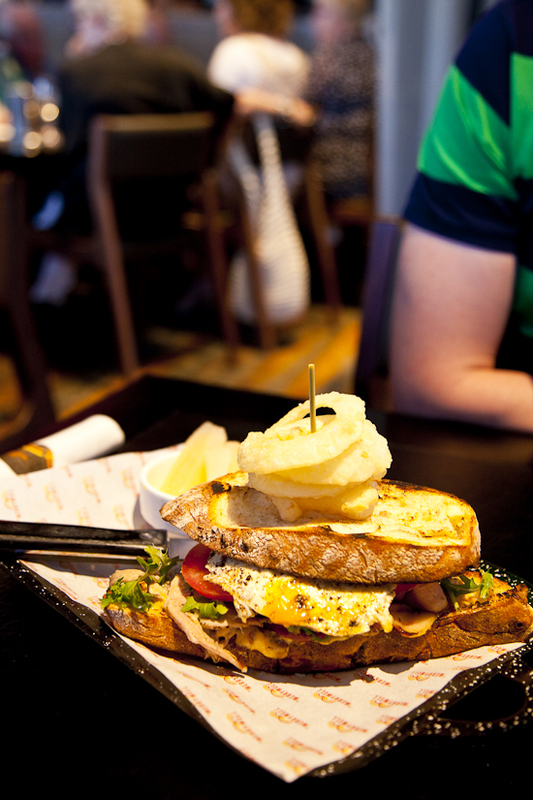 Each of these ingredients combined together into a quite full-on toasted gourmet sandwich. Served on the side was a small bowl of pickles. The pickles were shaped like chips, made with what seemed like a radish and being thick rectangular strips, and pickled consistently throughout in a mostly sour fluid - giving a sour taste but not too overpowering. The texture of the pickles was firm yet soft to bite through - much softer than a carrot stick but harder than a pickled gherkin. Overall the BLT seemed quite indulgent with all the butter and pork cuts inside. 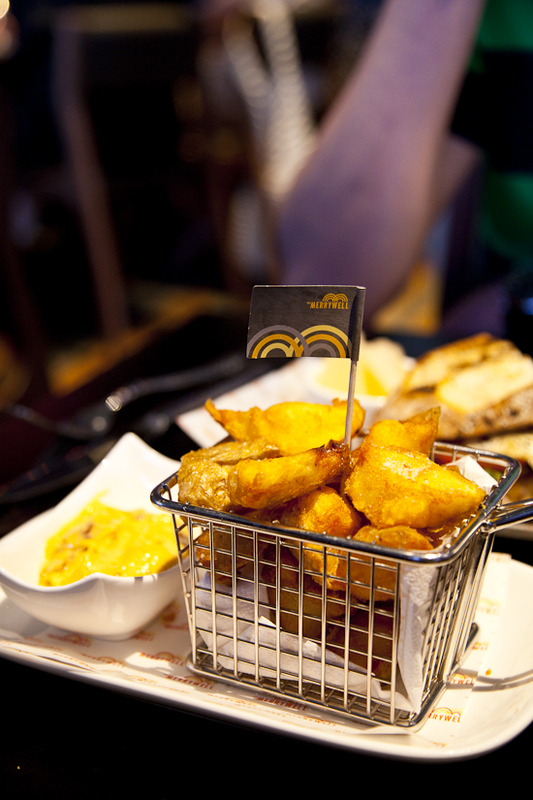 The Merrywell chips is described on the menu as crisp ripped potatoes, bacon aioli. The chips were small but thick chunks of potato that had been cooked (initially boiled?) throughout, coated and crispy on the outside and most than lightly sprinkled with salt. The chips were served with bacon aioli - an aioli that had small bits of bacon and paprika. The taste was a good combination of the creamy and lightly garlicky aioli with the sweet spice of paprika and the flavours of grilled bacon. I actually enjoyed these chips - the crisp and crunchy outsides made even better with the boiled potato like insides. Though with the bacon aioli, this made the meal seem quite heavy.